Enter the wee pirate, arrrrrr. See how he goes straight for the wee baby doll. Arrrrrrrr! That doll will walk the plank as sure as a parrot will spit in my eye—-the eye without a patch—arrrrrrrrrrrrrrrrrrr!!!……etc. 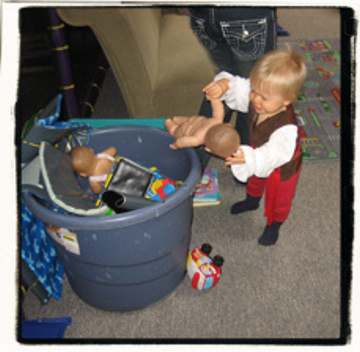 This entry was posted on Friday, October 31st, 2008 at 05:41 and is filed under BABY BABY. You can follow any responses to this entry through the RSS 2.0 feed. You can skip to the end and leave a response. Pinging is currently not allowed. OMG, PB—for a second I thought that doll was real!